The renowned painting Ophelia by Sir John Everett Millais depicts Ophelia from Shakespeare’s Hamlet having drowned herself in a stream, after discovering that her lover (Hamlet) has murdered her beloved father. The painting’s meticulously detailed and accurate portrayal of the flora show the true extent of Millais’ virtuosity and erudition as an artist, which combined, create a hauntingly beautiful image that is one of the Tate’s most famous paintings to date. It is known that Millais laboured over 11 hours a day for 5 months in order to achieve the naturalistic landscape and studied the botanical aspect of the scene intensely to create as accurate a portrayal as possible. After completing the landscape, Millais returned to London and used the model Elizabeth Siddal as his muse for Ophelia, nevertheless her hours spent posing in the cold water heated only by weak oil lamps left her gravely ill, and with her father threatening to take legal action against Millais, he was forced to pay for her doctor’s bills. 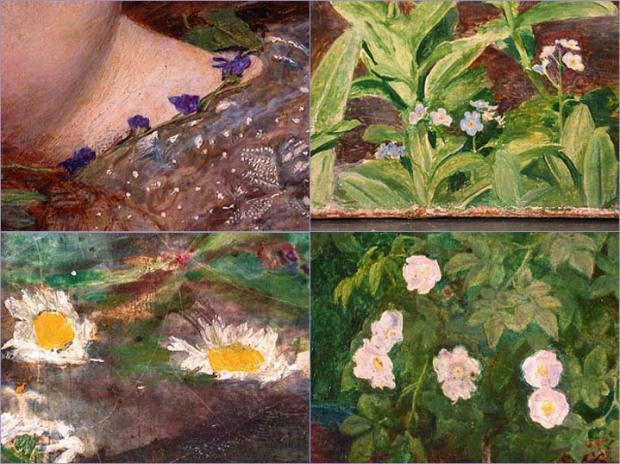 Millais paid careful attention and chose flowers specifically identified in Shakespeare’s ‘Hamlet’ to include in his painting. Ophelia, bereaved and disturbed, gives her brother a daisy and pansies in the last scene of the play, and these are apparent amongst the flowers seen scattered around her. The flowers symbolising love and death, youth and beauty reflect the tragic tale of Ophelia, whilst highlighting the skill and intellect of Millais as a Pre-Raphaelite artist.